At least that's how it is for now. 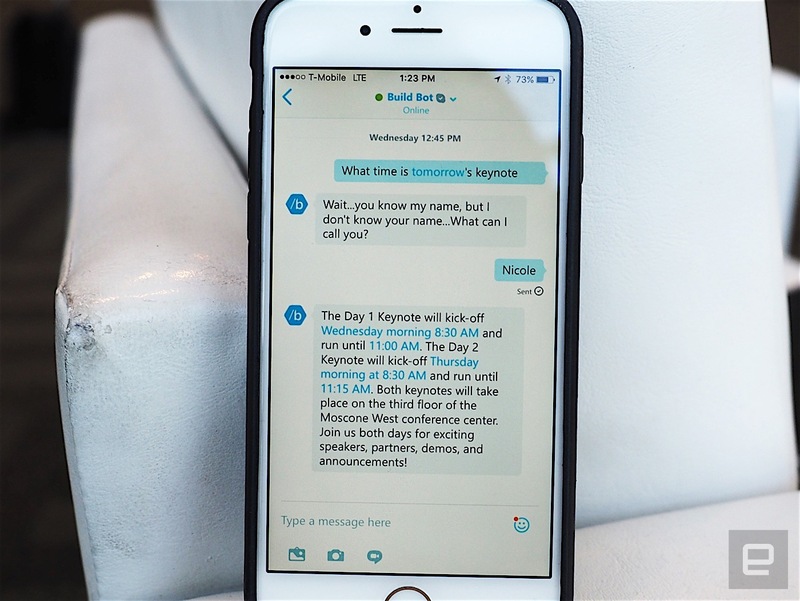 Earlier today, Microsoft announced that it would be integrating chat bots into Skype, thus allowing you to have quick conversations with a variety of businesses and services. At the Build 2016 keynote, we saw examples of how you could book a hotel through a WestinBot or order a pizza though a Domino's Bot. Those specific bots are unfortunately not available to the public just yet, but if you update Skype today, you'll be able to play around with at least a few chat bots to get an idea of how it all works. The way you add a bot is the same way you'd add a contact; indeed, the Add Contact screen in Skype now has two categories: People and Bots. As of right now, the only Bots available to add on Skype are Bing Music, Bing News, Bing Images, Getty Images and Build Bot (which is mostly centered around the Build conference). They're mostly in Preview mode at the moment (in other words, they're still sort of in beta), but they do appear to be functional. As you might expect, the chat bots respond to very specific keywords. You're not really having a conversation with these bots so much as you're typing in search queries. For example, with the Bing Music bot, typing in "Hello" would bring up Adele's song (a link to her YouTube video, it looks like) rather than polite small talk. A "Hi" in Bing News brought up articles with the word "Hi" in it. When I asked the Build Bot "What's for lunch?" it responded with different lunch hours instead of what was on the menu. Asking the Build Bot to tell me a joke just prompted it to say: "Sorry Nicole, I'm a BOT with a specific purpose... Build. I don't have the answers to everything. You might ask around or try this thing called the internet." Cheeky. In short, having a conversation with these chat bots feels a little like talking to a search engine, not a person. Which makes sense because these chat bots are all single-purpose, but it does show that they have their limits. If you're looking for a more complicated answer, it's probably easier to just make a call or look up your answer on Google (or Bing, naturally). Of course, it's still early days yet for Microsoft's AI strategy and we get the feeling that future bots will be a lot more intelligent. Plus once Cortana is integrated, it'll begin to feel a lot more natural. At least, we hope so anyway. You can try this out for yourself if you download the latest Skype update for Windows, Android and iOS. Mac users will have to wait for now. Get all the news from today's Microsoft Build keynote right here, and follow along with our liveblog!